On March 13th, 2009, Tristan Anderson, from Oakland, California, was critically injured in the village of Ni'lin after Israeli forces shot him in the head with a high-powered tear-gas canister. 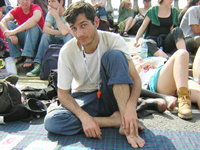 Tristan is a dedicated activist and reporter who has long been committed to social and environmental justice in the U.S. and abroad in places such as Oaxaca, Iraq, and Palestine. Tristan has posted his reports to Indybay since 2001. As a result of his injuries, Tristan Anderson, 37 years old, has been taken to Israeli hospital Tel Hashomer, near Tel Aviv. Anderson is unconscious and had been bleeding heavily from the nose and mouth. He sustained a serious injury to his forehead where he was struck by the canister. He is currently being operated on. The Israeli soldiers have to learn that the wall also imprisons them. Checking out your blog post-IAC09, India. Hope all is well? OT: This was made by Venezuelan state TV. It was difficult to subtitle, because they spoke so fast. The worker who is most militant in this video, is also an Evangelical Christian.